Well, as the old saying goes, "All good action/comedy web series must come to an end," so through the following pictures (and extensive therapy sessions), let's all work through our grief and bid a fond adieu to Scissor Cop. We shot everything in a day and our first scene was in a nearby park. 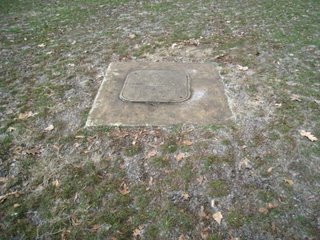 We lucked out with the discovery of this oddly shaped concrete slab that had the word "TELEPHONE" on it which doubled as our grave stone (through the magic of Photoshop). From far away, it kind of looks like one of the Dharma hatches on Lost. This was the first "flash-forward." I've had the idea to end Scissor Cop with flash-forwardS for a while and I feel that we executed it very well. Scissor Cop was always viewed as an action-y show and likened to "24" or "Die Hard" or "Lethal Weapon 4." However, for me, "Lost" was always the biggest influence on writing and structuring the episodes, especially with ripping-off (I mean, "blatantly stealing") their brilliant flash-forward storytelling device. Most of the episode was shot in the basement of my building where we had shot the bookends for Scissor Cop 6. We actually shot the beginning of the finale way back in October, on the same day we had finished #6. We knew it'd be too tough to try and match the continuity of the blood splattered newspapers, so we had to think of a way to get Johnny out of the room, hence the ol' "kick to the balls" trick (a plot device used since Shakespeare, I believe). Here's Benny laughing at his reprehensible thievery from Mr. Verde's "Box of Guns." That box is strictly "honor code" and he's taken advantage of it! The nerve! "Cocaine Bananas" - now sweeping the drug dealing world! R.I.P. McDunnough, beloved baby thief with the Unibomber's fashion sense. R.I.P. Raymond Driggs/Mr. Verde, beloved secret villain with an enthusiasm for all things bananas and fake mustaches.